Tiny, delicate leaves filled the car trunk to the brim. Life pulsed through each handful of dirt into the minuscule green veins. And with some rain, some sun, and a lot of TLC, these little leaves will serve generations of people who live in Bukudumira Village. The staff of the Mvule Program, Abraham Mulongo and Alex Bamulumbye, have been preparing Bukudumira to receive these saplings since April. Every two weeks, Abraham or Alex visited the village to teach the community how to prepare the ground for the saplings and how to care for the trees during their first year of life. When Abraham and Alex delivered the saplings to Bukudumira on Monday, August 20, they showed the community how to plant their saplings in the ground and reminded them how to care for them. With the holes for their saplings prepared, the community gathered around to watch Alex and Abraham plant the first tree in their village. It was a special moment of achievement for a community that had worked together diligently, and Abraham and Alex commemorated the occasion accordingly. It was also an important educational moment. Each community member planted their trees independently after watching Abraham and Alex demonstrate. With Kibo's help, Bukudumira Village planted its first mvule tree. The sapling is tiny and fragile, but in a year it will be six feet tall. In 50 years, its trunk will be as wide as a car. 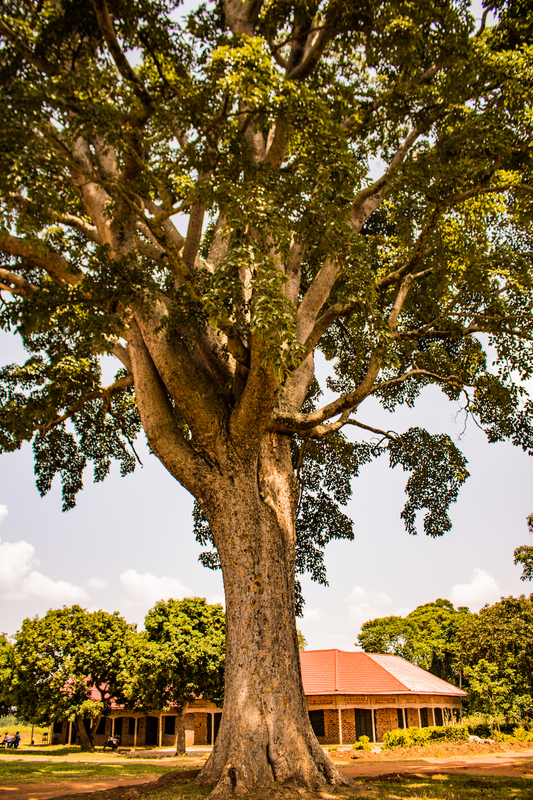 Of the 250 saplings Bukudumira received, 150 of them were mvule — the most important tree in Busoga culture. The other trees, musizi and giant lira, are soft woods that grow faster than the mvule, and are typically used for poles and firewood. The mvule saplings, on the other hand, will transform into the biggest, mightiest trees that grow in the Busoga region. FUN FACT: UNTIL THE BRITISH COLONIALISTS ARRIVED WITH SAWS, THE TECHNOLOGY AVAILABLE IN UGANDA WAS NOT POWERFUL ENOUGH TO CUT THROUGH THE HARD WOOD OF A THICK MVULE TRUNK. NOW THE BEAUTIFUL WOOD IS IN SUCH HIGH DEMAND THAT MATURE MVULE TREES ARE RARE. With Kibo’s guidance, the community met regularly in the months before they received their saplings to decide the responsibilities of each member as they care for the trees. Part of the decision-making process was who would receive trees, how many and of what type. The community leaders called out people’s names from their list as they distributed the saplings. Each community member received one or two mvule saplings as well as a musizi or giant lira sapling. While the mvule is a long-term investment, families will be able to use the musizi and giant lira within the next couple years. With all the necessary preparations complete and the confidence to plant their trees properly, the community members each took their saplings home. Kibo's Mvule Program often starts by providing village communities with trees to help address deforestation in the region. As the population grows, the demand for wood increases — and the tree population has a hard time keeping up. Wood is necessary for cooking fires and for constructing buildings and tools. Fast-growing, soft-wood trees help address some of the immediate problem. Within a couple years, these trees produce fruit or can be cut down for firewood and construction. Mvule trees, however, are especially important culturally and economically in the Busoga region. While it is growing, the mvule will provide shade and beauty to the village. Coffee, which is otherwise scorched in direct sunlight, can grow in the mvule's shade. When the community members are ready several decades from now, they can cut down the tree and sell its wood. For future generations, the payback is overwhelming: Each sapling was only 2,000 shillings, or about 50 cents. At current prices, mature mvule wood sells for millions of shillings. A mvule tree acts as a retirement account for the village while combatting climate change, mudslides and deforestation as it grows. Kibo encourages communities to plant many trees to replace each one it uses for timber. If mvule trees are still in Busoga 100 years from now, it won't be because an organization planted a couple hundred trees. It will be because Busoga communities realize that tomorrow depends on their actions today. Only then will a culture of replanting trees take root among a people and their children. The Ugandan government strictly regulates mvule timber, since mature mvule trees are so rare. The mvule saplings that Bukudumira planted are an investment in their children's and grandchildren's futures.